There is no such thing as a failed experiment. Only experiments with unexpected outcomes. Einstein is famously quoted for his observation that “the problems that we face will not be solved by the same level of consciousness that created them.” Particularly if we get stuck looking at the problems and not spending time understanding what created them-the root causes-or developing the new level of consciousness necessary-the perspectives and practices that can address our challenges. In the work of sustainability and social change, I often find that-despite the number and worthiness of issues we have to focus on-we also create obstacles on an individual and institutional level which make the hard journey of creating transformative change even harder. There are relational obstacles that we generate-through differences of opinion or other conflicts with those we work with-and there are systemic obstacles to deal with: primarily the challenges in the way we approach the problem. In a recent article around Hawaiian Monk Seal conservation efforts, those seeking to conserve an endangered species alienated precisely those who could help them most in achieving their goals-the native Hawaiian population. Usually the greatest barrier to solving a particular problem is identification with the problem itself. We often talk about what we are against, rather than what we envision and want to see for our communities and our world. If we identify the problem itself as the focus-rather than defining a clear set of values and a vision that we want to achieve-we limit the options for actually solving that problem. 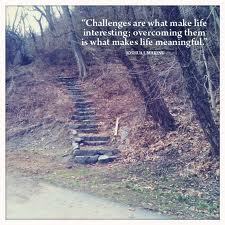 We need to begin with an attitude where we believe that the obstacles we face may be overcome. This doesn’t mean acting like a Pollyanna or ignoring the problem, but to approach obstacles as opportunities to learn from or puzzles to be solved. Obstacles are seductive and possess a tremendous amount of power, especially if we continue to invest energy in ident fying with the problem rather than seeking the solution. Martin Luther King shared that “Through violence you may murder a murderer, but you can’t murder murder. Darkness cannot put out darkness. Only light can do that.” A great deal of behavioral research has shown that bad habits aren’t addressed by focusing on the habit you are trying to change, but by creating new habits that pattern what is desired. We often create obstacles because of our expectations in terms of the way something should be or how someone should behave. In developing creative approaches to novel challenges, we might look to research on play as a critical developmental tool for humans and other animals. Evolutionary biologist Marc Bekoff “think[s] of play as training for the unexpected.” What might it mean to “play” a bit more when confronted with obstacles-conflicts with others, an overwhelming amount of work, a seemingly intractable situation, or a combination of “all of the above”? Perhaps if we could see obstacles more as adventures, and tried to approach them with the combination of excitement and openness to the unknown when embarking on something new, we would get stuck less often-and might even design (or just stumble upon) creating a different consciousness to address our challenges and those in our field. We often forget that life is an ongoing adventure. We leave our homes for work, acting and even believing that we will reach our destinations with no unusual event startling us out of our set expectations. The truth is we know nothing, not where our cars will fail or when our buses will stall, whether our places of employment will be there when we arrive, or whether, in fact, we ourselves will arrive whole and alive at the end of our journeys. Life is pure adventure and the sooner we realize that, the quicker we will be able to treat life as art: to bring all our energies to each encounter, to remain flexible enough to notice and admit when what we expected to happen did not happen. We need to remember that we are created creative and can invent new scenarios as frequently as they are needed.